If you’re one of my international readers chances are good you care nothing about baseball. I’m glad for you. I hope your life is filled with correspondingly high minded pursuits. As for me, I grew up in New Hampshire and obedient to my locale, came to love the professional sports teams in nearby Boston. I was lucky to be a fan of the Boston Celtics in their legendary “Bill Russell era” when they won 11 NBA championships. I listened to their games on our old tube radio. Really. I’m a fossil. So how is it that I root for New York’s National League baseball team, The New York Metropolitans, who are better known by their colloquial name “the Mets”? Well, in 1969 the hapless Mets (who were created out of nothing in 1962) won the World Series. I was 14 years old. I found their improbable “rags to riches” story altogether compelling. They were a team of castoff players with five extraordinary young pitchers and they performed miracles. They were the Amazing Mets. The Miracle Mets. They made baseball fans out of people who had never before paid any attention to the game. You have to understand that in 1962 the Mets lost 120 baseball games. And suddenly they were the scrappiest, grittiest, luckiest team in all of baseball. The Amazing Mets. I was a blind kid. So of course I was caught up in the joy of the underdogs toppling baseball’s royalty. I’ve never forgotten it. When the 1986 Mets played my beloved Boston Red Sox in the World Series I let fate determine the matter, which is to say that I told my father the Red Sox would likely blow it. Enter Bill Buckner. I still love the Red Sox. Always have. But the Mets were pure magic the year I was 14. The album topping the charts was Abbey Road. I was a kid with very bad eyes who wore spectacles thick as padlocks on his face and who worried he’d never fit in anywhere in this world. The come from behind, utterly improbable Mets gave me a sporting thrill I’ve never experienced since. When my beloved Red Sox finally won the World Series (and then won it again three years later) they were arguably the best team going. 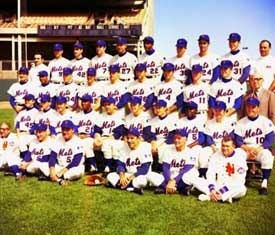 The 69 Mets were beautifully unlikely. And so I still root for the team from Flushing, Queens. They are now nearly bankrupt, losing with multi-million dollar players, their fan loyalty eroding. 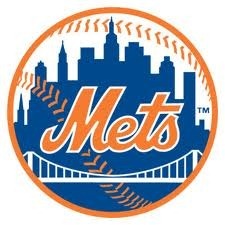 But they are the New York Mets and I wear their team regalia with ardor. They will always be my Mets. I love you Tom Seaver, wherever you are. OK, so, perhaps it is better to keep the L.A. Dodgers out of the conversation at this point in time as you wax nostalgic about the great sport of baseball.